To purchase ACT-To-Outlook Professional, click on the Buy/Purchase Button and it will take you to the web site for purchase. When the product is purchased, you receive a license code (some of our partners also call it a Serial Number), indicating that your product has been purchased and paid for. When you purchase ACT-To-Outlook Professional, you are provided with a License Number (in some cases it is called a purchase serial number). This number is your proof that you have purchased the product. To activate, enter the license in the Registration->License Activation screen. 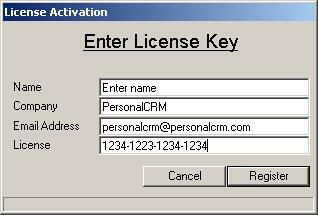 This will register your software with ACT-To-Outlook.com's License Registration Server and enable your product. The license provided to you will only work on 1 computer. If you attempt to activate the software on another computer, the license server will not allow that. 2. Enter the registration details and instructions to activate the product will be sent to you.